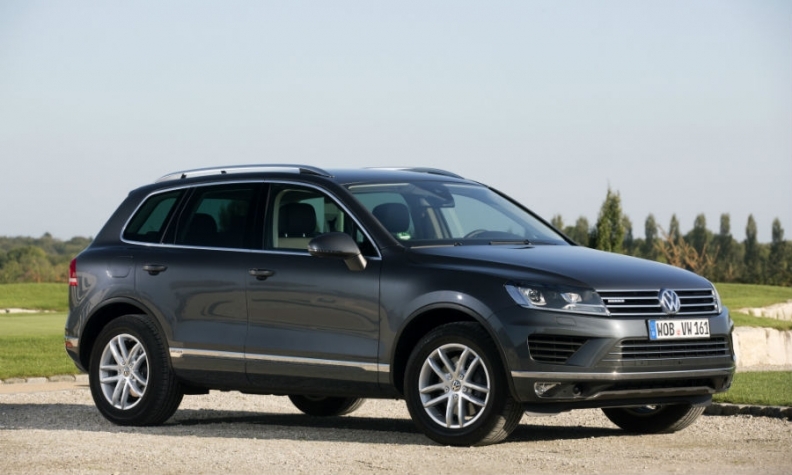 The recall affects the latest Touareg Euro 6 diesel model. HAMBURG -- Germany's motor transport authority, the KBA, has announced a global recall of some Volkswagen's 3.0-liter diesel Touareg SUVs after detecting two illicit emissions control devices in the model. The recall of the Touareg model of the latest Euro 6 diesel generation was ordered on Dec. 8 and affects 57,600 models globally, about half or 25,800 of which are in VW's German home market, the KBA said by email. "Two inadmissible switch-off devices were found upon examination of the VW Touareg 3.0-liter diesel Euro 6 by the Federal Motor Vehicle Authority," the KBA said. New evidence of Volkswagen's deployment of defeat devices continues to emerge more than two years after its emissions-test cheating scandal broke in the U.S., despite the automaker working to draw a line under the affair. Volkswagen announced last week it had stopped delivering the T6 Multivan to dealers after detecting that diesel models emit excessive nitrogen oxide levels and had reported the findings to the KBA. The Touareg action also follows a recall by German authorities in July of 22,000 Porsche Cayenne SUVs in Europe, the Touareg's sister model which shares the same modular platform and also uses the 3.0-liter engine developed by premium VW stable mate Audi. KBA said that an emissions-lowering "warming-up strategy" that got activated on the Touareg model when the vehicle was examined in static roller-bed tests carried out under the new European driving cycle (NEFZ) did not, for the most part, go into operation in road testing. The automaker has adjusted production of the Touareg and developed a new engine software to help fix the affected vehicles, KBA said. VW, which in September 2015 admitted to systematic manipulation of engine management software to rig emissions tests, couldn't immediately be reached for comment.